While plenty of smaller companies are trying to improve the skills of their workforces, some find the process just too costly or time-consuming, according to a new survey. The good news from the poll of 2,513 small and medium-sized enterprises (SMEs) is that 68 per cent have invested in manpower development programmes in the 12 months to May, with construction firms being the keenest. However, the survey also found 85 per cent face obstacles in their efforts to upgrade employee skills, particularly manufacturing firms. Notably, about 50 per cent of those companies said a lack of staff was the main factor preventing them from sending more workers for training while 38 per cent cited other priorities. 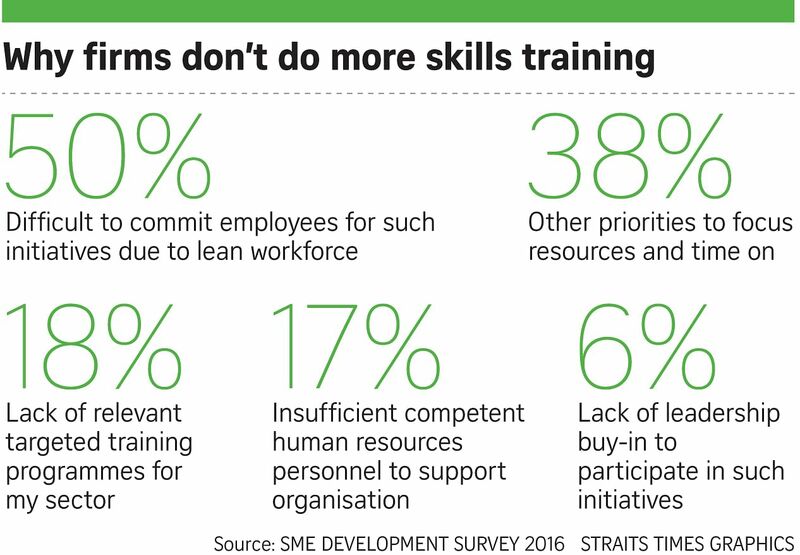 Upgrading staff skills will be a major challenge for SMEs in the next few years, said Mr Lincoln Teo, chief operating officer of DP Information Group, the business intelligence and credit analytics firm behind the study. "Singapore is entering a slow growth period and most SMEs are experiencing challenges growing their revenue while managing cost and improving productivity," he noted. "In the last few years, the focus has been on SMEs becoming leaner and more productive to stay competitive. Many SMEs simply do not have the capacity to redeploy their employees into training as it will impact the day-to-day operations of their company." 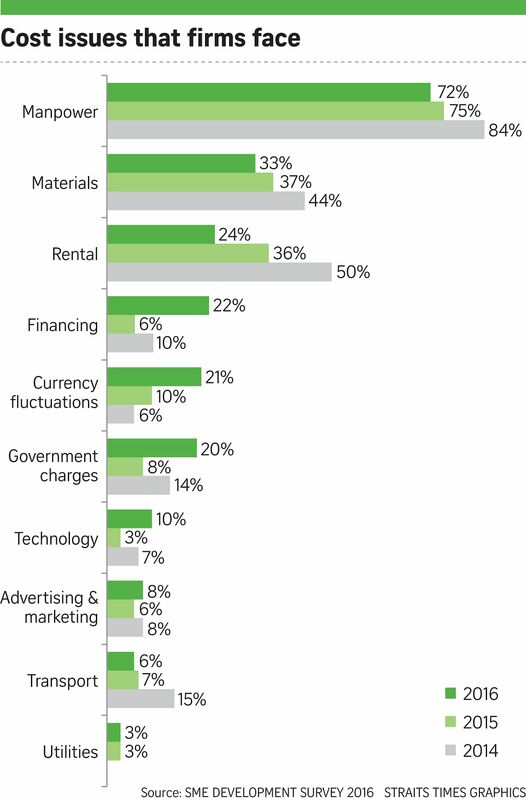 The study also found that SMEs are grappling with a significant new challenge this year - tougher access to financing and the higher cost of funds. The proportion of SMEs with financing issues has risen to 22 per cent this year from 14 per cent last year, while those that have difficulty coping with the cost of financing has leapt to 22 per cent from just 6 per cent previously. About 46 per cent of the SMEs with financing issues said higher bank interest rates posed the biggest problem, while 34 per cent said they are being squeezed harder by their suppliers with tighter access to supplier credit. Ms Leung Wai Ling, assistant chief executive at enterprise development agency Spring Singapore, said the government agency will work with the financial institutions to help SMEs gain access to financing. Singapore Business Federation chief executive Ho Meng Kit said: "The slow economic growth presents a deeper underlying set of challenges plaguing the SME sector - there is insufficient demand to ensure survival, let alone propel growth within the sector. "Greater emphasis should be placed on helping our SMEs venture overseas where there are more opportunities."